Ferocious. Jeremy Saulnier directs cinema that beats you to a pulp and just when you think you can breathe, he lays one more gut punch on you to ensure the experience resonates. Ferocious. Absolutely ferocious. The sound of male angst pulses through the graffiti drenched walls and you can almost see the amount of hate that has permeated that plaster over time. There was a time when I labeled myself as "punk rock" and I would wander the halls of some ugly, worn down venues in a daze, but never like this. Nothing like this. The film opens with an overhead shot of a van that had plowed into a corn field, and it's clear this was not done intentionally. The driver is Pat (Anton Yelchin), the bassist of the band and he fell asleep at the wheel. They're safe but out of gas. The reckless life of punk rock, but little do they know that such dangers pale in comparison to what they're about to face. Broke and faced with the possibility of having to siphon gasoline in order to find their way home, the band is offered a gig with a little bit higher pay but an ominous vibe to it: a show for a crowd of skinheads. Pretty much the rest of the film takes place in this single location. A living hell. They finish their set and are ready to hit the road but Sam (Alia Shawkat) realizes she left her phone back in the green room, and when they walk in they see a body on the floor. Witnesses to a murder. Surrounded by Neo-Nazis. No way out. The owner of this place, a man named Darcy (played with terrifying perfection by Patrick Stewart) weighs his options but throughout his calculations you never get the sense of remorse over what must be done. There is never a true glimpse of humanity over innocent lives ending simply for being in the wrong place at the wrong time. This is his business, his livelihood and he must protect it by any means necessary. What he must do is ensure that no one inside the green room gets out alive. Saulnier not only directs this picture with supreme confidence, he also penned the screenplay that is absolutely spot on from start to finish. It's remarkable just how real Green Room feels, especially when you consider how the basic plot must sound when you are asked to briefly describe it to others. A group of skinheads trying to kill a punk rock band. Ridiculous, right? Not while you are inside this world Saulnier has crafted. During these lean, brilliant 90 minutes, the fear that these characters feel reverberates through us even with very little time spent worrying about developing the characters. That isn't a criticism, it's a compliment because Saulnier wants to keep everything focused on the present to heighten realism and it proves effective. We don't need flashbacks or life stories or the concerns of outside forces in their lives. It's about survival for those that have barely had a chance to live. The threat to their future is so senseless and horrifying that it is impossible to not care and root for their safety, but Saulnier refuses to paint their portraits with too drippy of a brush so there is never a feeling of predictability. So many times when watching films it isn't a matter of whether the protagonists live, it's how they manage to do it because the happy ending is guaranteed. Not here. Not a chance we can feel safe inside the green room. Bodies and blood are left in the wake of a maniac and his loyal men and at times it is hard to watch. Green Room is brutal yet bravura cinema, the type of work that made me want to turn away and hide from the pain but I couldn't. The performances are too precise, the frames too richly detailed even when the location is soaked in colorless dread. The spacing is so claustrophobic you can't wait to breathe again, and yet when they step outside of that room everything feels so big you can't help but want back into the cramped quarters. Death lurks out in the open in the darkness. Sound is utilized sublimely, from the rage of the music serving as subtle background noise for chaos to the high pitched feedback designed to unnerve. Green Room isn't for the faint of heart and I know many would be turned off by the graphic nature of the violence, but it never feels out of place or forced. Some filmmakers want to splatter their lens with red with the only intention being to shock to the point that it's over-the-top, but not Saulnier. The blood he spills matters as a piece of the storytelling. The desert island band concept is ingenious because it really taps into a nostalgic feeling for me, remembering a time when I would have answered solely to fit into a mold that never truly made me feel comfortable. The strange desire to constantly maintain an image rather than be true to myself. Eventually you realize how silly that is and you stop being ashamed of honesty and start embracing what makes you happy. For these band mates it happens just before they face what seems like certain death, a last bonding moment when they drop the facade and just live their musical truth. It's a perfectly timed bit of warmth and comedy, a tiny but necessary calm before the storm grows even stronger. Patrick Stewart asks if he is still breathing, and strangely we pray the answer is no. We know that's the best case scenario. He is, but barely. 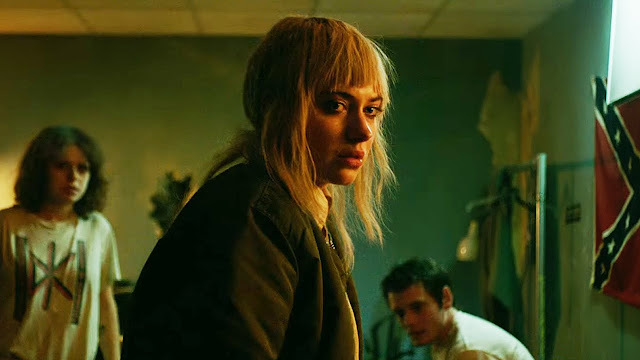 Imogen Poots with a box cutter is the hero we deserve. 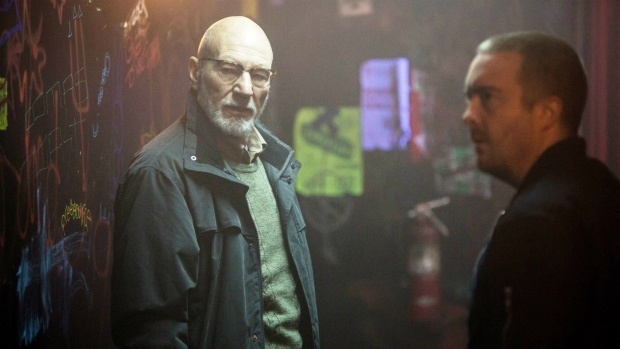 Green Room is the film I desire, an expertly pieced together, exhaustive thriller that shreds us apart with tension and knife cuts that soak through the carpeting. 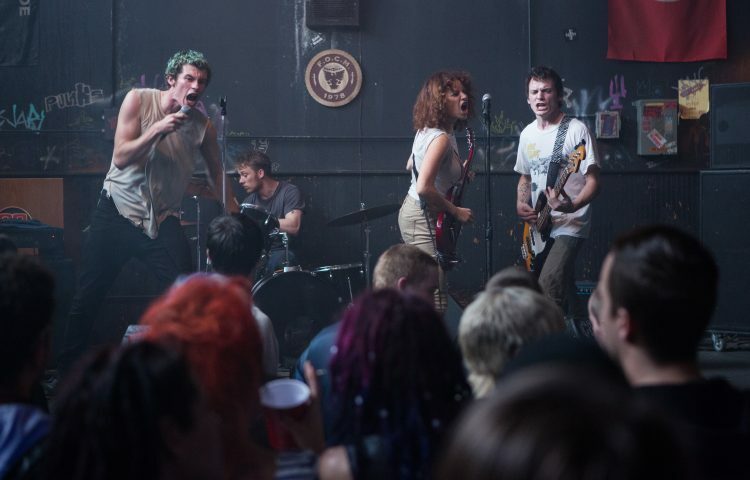 A punk rock masterpiece that has an awful lot to say, more than many will give it credit for because it isn't until afterwards when we can reflect on the experience that clear eyes and functioning minds can see just how smart the film is. During the movie, who the hell has the time to analyze? Who has time to dig deeper? This is a picture that grabs you and has no intentions of letting go, at least not until we feel battered and bruised like I do now. So what does it say about me that I can't wait to watch it again and again?